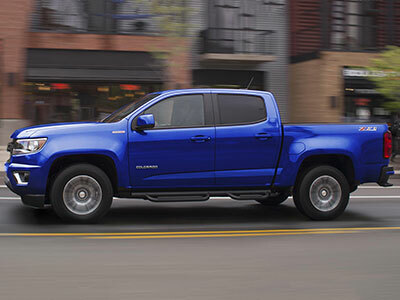 Mid-size trucks like the 2017 Honda Ridgeline and Chevrolet Colorado are perfect for drivers who crave off-road adventure and major utility - which you get without the heavier footprint of a full-size model. Since both of these models have been recently redesigned, you may find yourself wondering which is the truck for you. Our comparison guide is here to help - check it out before you start shopping. After a complete redesign, the Ridgeline supplies best-in-class comfort, with a smooth ride and a family-friendly cabin. All models feature a crew cabin, which means two rows of generous passenger space. Seats are broad and nicely padded, so passengers of all shapes and sizes will feel right at home. The Colorado is available with a four-seat extended cab or a five-seat crew cabin, the latter of which provides impressive backseat space. We like the front bucket seats, which provide off-road-friendly bolstering to keep you snug and supportive in rugged territory. You do have to pay extra to get the crew cabin, unlike in the Ridgeline, which only features this roomy cabin option. The Ridgeline is one of the most innovative trucks on the road, and it's especially tailgate-ready. It features an exclusive lockable in-bed truck, which you can load up with ice (it features a handy drain for when the ice turns to water) and beer. As far as infotainment is concerned, the Ridgeline has everything you need to stay in the loop. Apple CarPlay and Android Auto display smartphone apps on your central touchscreen, so you can access music and map options with minimal distraction. The Colorado also impresses with its tech features. The MyLink infotainment system is straightforward, so you don't need to be especially tech-savvy to figure it out. It also includes Apple CarPlay and Android Auto functions for complete smartphone integration. You won't find a built-in trunk-slash-cooler in the Colorado, but it does a great job keeping you connected. The Colorado puts its best face forward in this category. With a max tow rating of 7,700 pounds, it's the right choice for drivers with especially heavy boats at home. Choose the powerful turbocharged four-cylinder diesel engine for world-class performance on-road and off. And, speaking of rugged territory, the specialized Colorado Z71 comes standard with everything you need for the trail, including all-terrain tires and an off-road-oriented suspension. The 2017 Honda Ridgeline features a unique unibody chassis, which makes it feel more like a crossover than a traditional truck. That means that it's easier to maneuver around town than other models. And its fully independent suspension creates a smoother ride to boot. 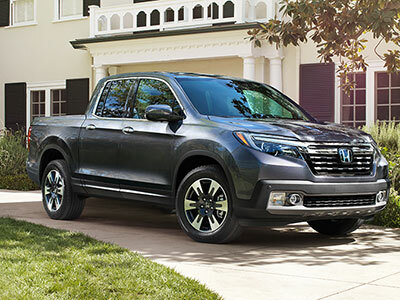 The Ridgeline isn't a towing leader, however - it's rated for 5,000 pounds max. Still, that's not too bad. It'll definitely haul your Jet Skis to the lake or take your Airstream down the highway. This was a close call, but the Ridgeline noses ahead with its host of driver aids and excellent crash-test scores. In government crash tests, the Ridgeline pulled away with a perfect five-star rating for overall protection. Items like lane departure and forward collision warning alert you to nearby danger, and they can even intervene to keep you safe. Lane keeping assistance gently corrects your steering to keep you between the white lines, and the automatic emergency braking feature jumps into action when it senses an oncoming collision. The Colorado's OnStar telematics system really comes in handy when you're facing the unexpected. It includes features like on-demand roadside assistance and automatic collision notification. There's just one catch - you have to pay a yearly subscription fee for these services. These mid-size trucks have a lot going for them, but the 2017 Honda Ridgeline's A-game blows the competition away. Inside, you'll find plenty of space and comfort with fun and innovative features like the in-bed trunk compartment that are both work- and party-ready. On the road, the Ridgeline delivers the power you need for off-roading and boat towing. Safety gear is the cherry on top, providing the protection you need in heavy traffic.